Dwayne Perreault - The Rhône is strangely disparaged by some and venerated by others. While everyone seems to blindly agree that Bordeaux and Burgundy make excellent company, putting Rhône wines on the table is like inviting the in-laws to your house: you either like them or you don't. I do, and in fact southern Rhône wines like Gigondas and a good Chateauneuf du Pape (I happen to sell Château Fortia) are some of my favourite wines. 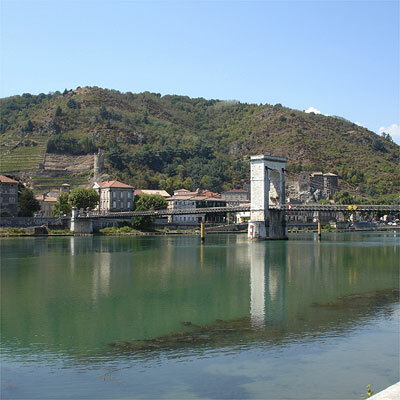 But it is the northern Rhône which gets the serious wine lover's attention, and this is largely due to its noble grape, Syrah, seen by most to be superior to its thin-skinned southern neighbour, Grenache Noir. In fact, I was told at WSET wine college by a Master of Wine that Grenache is almost to be despised: low in tannins, oxidative and one-dimensional, it is incapable of producing vins de garde. But for the French, opinions are like wines; everyone has some. As for white grapes, Viognier has emerged from its palace in Condrieu and has now travelled around the world, finding second homes in the new world and in the Languedoc where it is used to make mostly fruity, off-dry vins de pays. Marsanne and Roussanne are lesser known and Marsanne is described by most as being rather flabby and low in acidity, hardly positive references for any white grape. But Marsanne is the grape most commonly used to produce white Hermitage, France's most long-living white wine. Despite its low acidity, this is a grape capable of producing world-class whites which can easily be aged 15 years. Camping underneath a rock escarpment near a town called Saou (which sounds like the French word for 'drunk'), I noticed that Marsanne is also a village, and being only a 15 minute drive away I decided to visit. It's a pretty little place on the hot plains of the valley, and I immediately parked myself in a shady spot of the local cafe and asked if their house wine was made from Marsanne. The waitress seemed confused. "We do not grow grapes in Marsanne," she said." It's too hot here. We grow grains, cereals." "Yes," I replied, "I can see that, but surely you've heard of the Marsanne grape?" She hadn't. Like Jesus, poor little Marsanne is unrecognized in its own village. No visit to the Rhône would be complete without seeking out one of its top producers, and few (if any) are more highly regarded than M. Chapoutier. 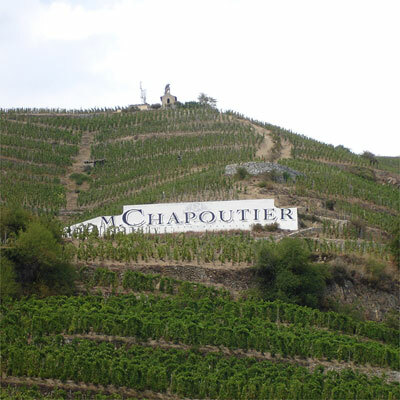 Founded in 1808, Chapoutier uses traditional (now biodynamical) methods to produce its wines; in fact, they own the largest area of biodynamical vineyards in the world. I was received very warmly here by Odile Misery, regional export manager, who took the time to show me the vines at Les Gréffieux, with l'Hermite and its chapel at the top of the hill above. Odile pointed out that though the chapel belongs to Jaboulet, all the vines around it are Chapoutier's. Seeing how Chapoutier's and Jaboulet's vines are adjacent to each other in places, I asked Odile if Chapoutier, being a biodynamical producer, was concerned about Jaboulet's viticultural practices, for example spraying with pesticides. Her response was diplomatic, downplaying the effect this might have on the biodiversity of Chapoutier's vineyard. "As you can see, it's too steep to use machinery, so any spraying is small and done by hand." When I asked the same question to Nicolas Joly at the Renaissance des Appellations in Amsterdam, he was a little more direct with his answer: "Chapoutier is doing his neighbour a favour, and his neighbour is doing him a disservice." I tasted 16 different wines at Chapoutier; that's too many to review here, but here are some of them, starting with whites: St. Péray Les Tanneurs 2007 is made from 95% Marsanne and 5% Roussanne and has a bouquet of straw and acacia honey with a medium thick texture and low acidity. Prominent apple and spice flavours combine with vanilla, almond and wood tones in this full-bodied dry white with 13,5% alcohol. The Condrieu Invitare 2008 (100% Viognier of course) has great viscosity and a strong attack with smokey, mineral white fruit in the mouth. There is persistent fruit in the long-lasting aftertaste, with wonderfully blended alcohol and minerals: you really can taste the granite. 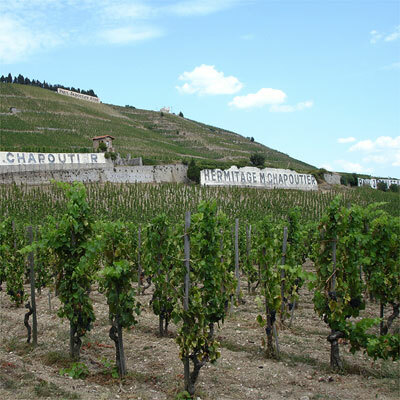 Chapoutier's Hermitage Chante Alouette (100% Marsanne) is one of the most famous white wines of the Rhône, notable for its longevity. The 2006 had a sweet bouquet of raisins and figs and had a noble taste sensation of fruit poking through incredible alcohol (14,5%). Someone once asked me what I meant when I said at a tasting that a wine had "really good alcohol." This wine personifies what I mean. The St. Joseph Les Granits 2000 gave me an indication of how Marsanne can age. Made from the oldest vines in the estate, it has a golden bouquet of nectarines and dried flowers. This was drier and more mineral in character than the Chante Alouette 2006, with a delicate balance of fruit and alcohol. I wonder how that Chante Alouette will taste in 2015. I have one bottle and hope to find out. After a lunch break, we continued with the reds. None of Chapoutier's wines should be underestimated, and that includes the affordable Rasteau 2007 (80% Grenache, 20% Syrah), very refreshing with tangy berry flavours. The Gigondas 2007 (90% Grenache, 10% Syrah) is more complex, with a soft bouquet of sour dark fruit and cocoa and a taste of extremely concentrated dark berries with zesty acidity and a solid tannic structure. Curiously, the Chateauneuf du Pape 'La Bernardine' 2006, made from the same grapes had more red fruits in the mouth, but with solid tannins backing it up. The 2005 had more noticeable mineral concentration, with a hint of iodine and licorice. The last three wines were sublime. The Côte Rôtie 'Les Bécasses' 2006 (100% Syrah) had stuffy red fruit and something like old socks in the nose. Silky in the mouth, it had amazing tangy red fruit expression with softer tannins backing it up in a long aftertaste. L'Hermitage 'Monier de la Sizeranne' 2006 has a dark, smokey and sweltering bouquet with strong notes of pepper and even goat's cheese. Possessing a strong attack of dark fruit with notes of something indescribable--I thought of truffles--it is mouth-dryingly tannic but with a very long aftertaste. These are wines which clearly deserve ageing. As a testament to Chapoutier's expansion into other countries (100 ha are planted in South Australia), we finished off with a Portuguese wine, the Extremadura Ex Aequo 2006, made from 75% Syrah and 25% Touriga Nacional. A very well-balanced oak-influenced wine with notes of leather and tobacco in extremely strong and expressive dark fruit. It was a hot and sunny day, but late into the tasting it suddenly began to pour rain. This was good news; it had been so hot and dry that the rain was needed. I haven't heard how the harvest went, but 2009 was shaping up to be an excellent vintage, far better than 2008 and possibly as good as the exceptional 2007.